Aiming to satisfy our clients, optimally, we provide our clients with a quality approved array of Fancy Brass Aldrops. With the use of excellent quality materials and contemporary technology, offered fancy brass aldrops are efficiently manufactured in line with set industry standard. Due to their eye catching designs and excellent strength, these fancy brass aldrops are hugely acclaimed in market. In addition, our provided fancy brass aldrops are available at reasonable prices. "Shree Sayona Enterprise" started its business operations in the year 2000 at Jamnagar( Gujarat, India). 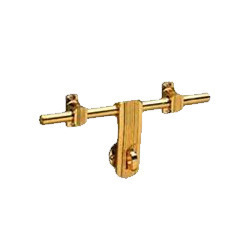 Since inception, we have emerged as one of the trusted names involved in manufacturing and supplying a wide array of Brass Hinges, Brass Brackets, Brass Handle, Brass Tower Bolts, Brass Door Eye, Brass Gate Hook, Brass Sanitary, etc. Our product range is widely cherished across the Indian markets for reliability, high sheen, proper polishing, long functional life, durability and superior quality. To meet the needs and demands of our customers, these products can be availed in varied shapes and sizes. Not only this, our product range is available in Steel, Satin, Gold and Antique finish.